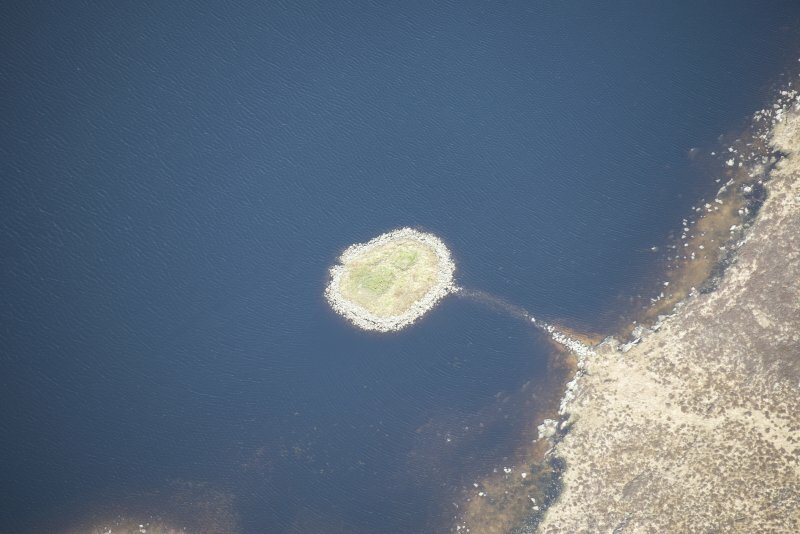 Oblique aerial view of Dun Anlaimh on the Isle of Coll, looking NNW. Coll, Dun Anlaimh, Loch Nan Cinneachan. General view from south. 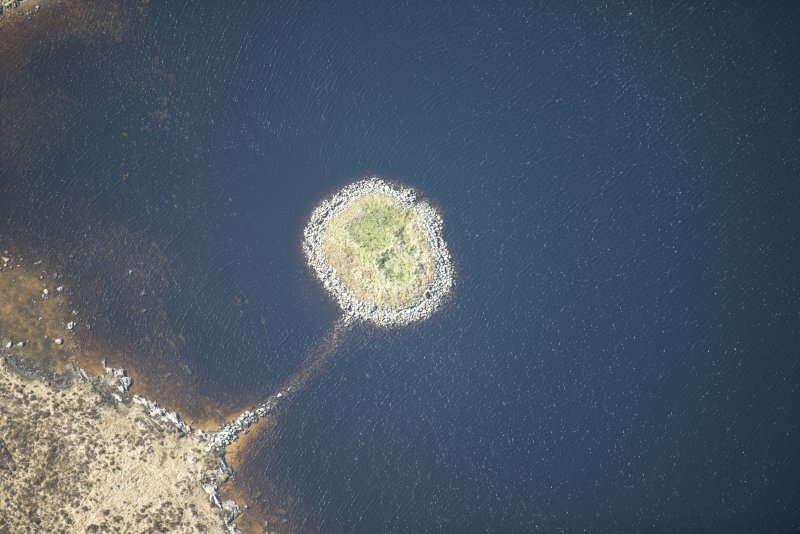 Oblique aerial view of Loch nan Cinneachan centred on the remains of an island dwelling on a crannog, taken from the ESE. 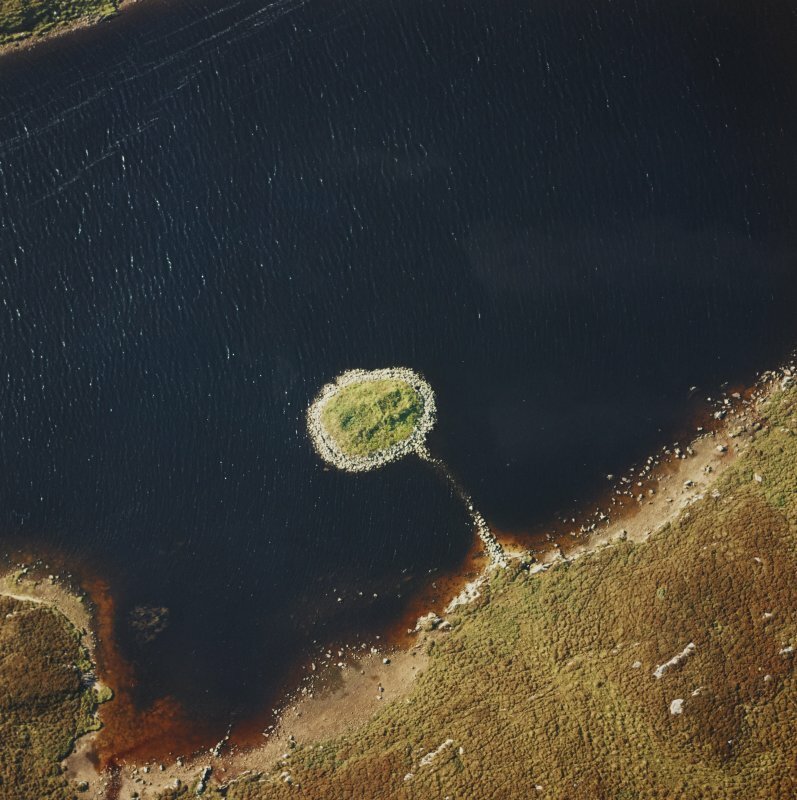 Oblique aerial view of Loch nan Cinneachan centred on the remains of an island dwelling on a crannog, taken from the SE. 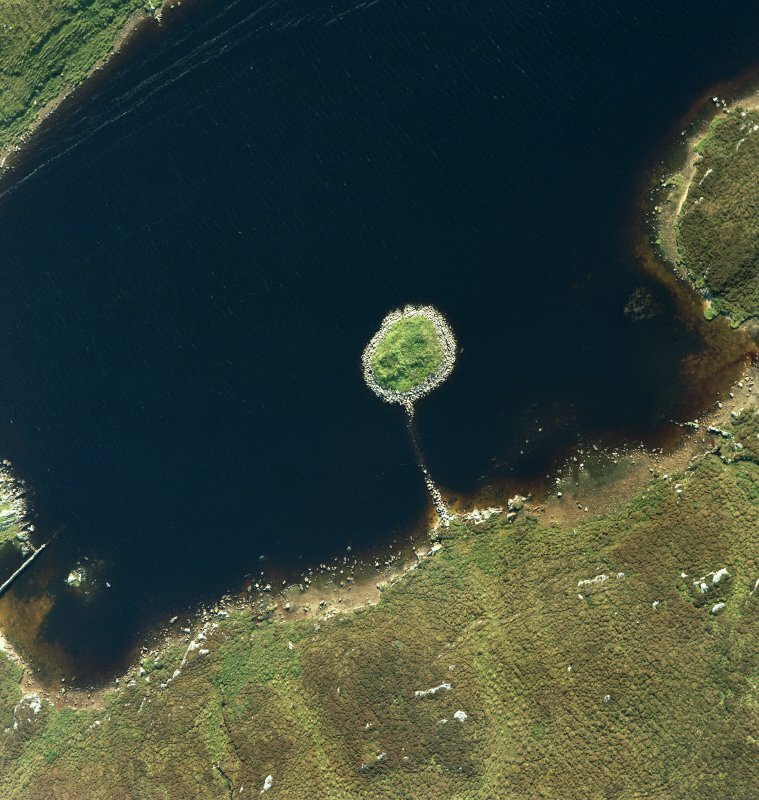 Oblique aerial view of Loch nan Cinneachan centred on the remains of an island dwelling on a crannog, taken from the SSE. 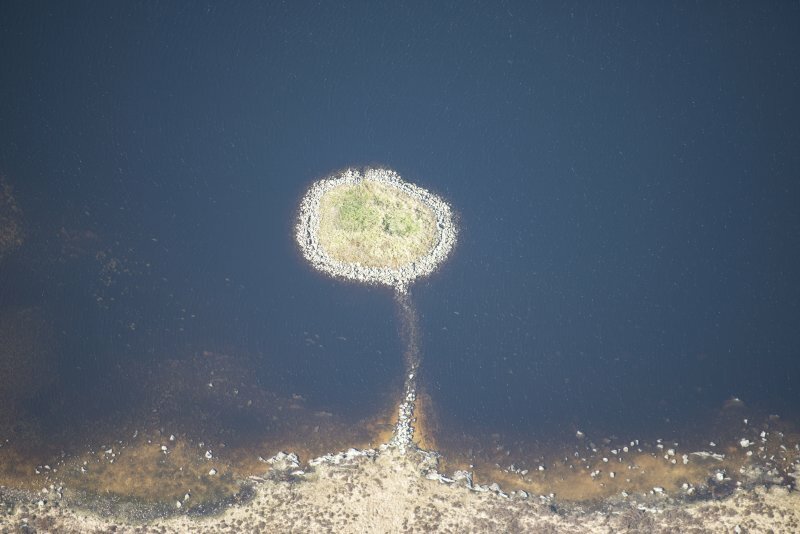 Oblique aerial view of Loch nan Cinneachan centred on the remains of an island dwelling on a crannog, taken from the NNE. 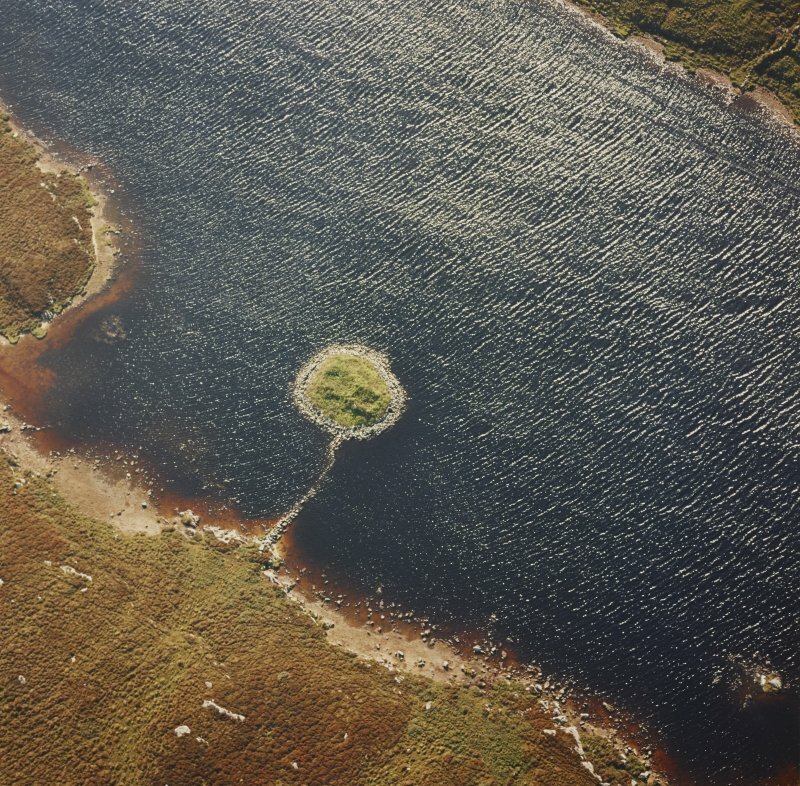 Oblique aerial view of Loch nan Cinneachan centred on the remains of an island dwelling on a crannog, taken from the NE. Oblique aerial view of Dun Anlaimh on the Isle of Coll, looking SW.
Oblique aerial view of Dun Anlaimh on the Isle of Coll, looking W.
Coll, Dun Anlaimh, Loch Nan Cinneachan. 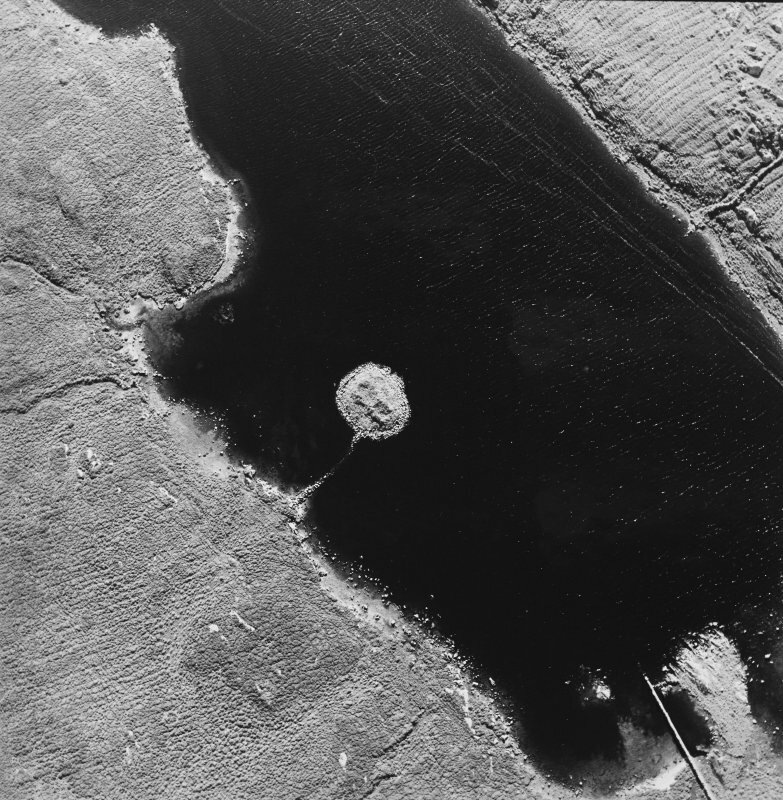 General view of crannog. (NM 1884 5684) Dun (NR). 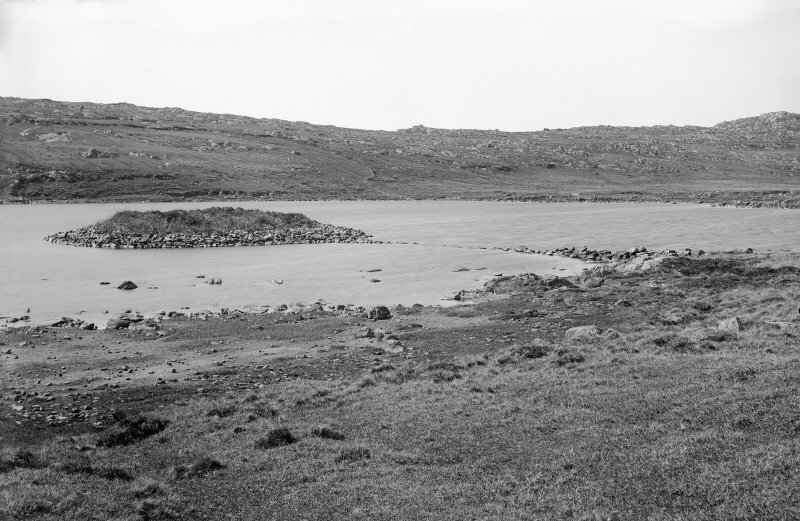 This example of the insular duns of Coll, which compare with those of the Outer Isles and which are of uncertain date, is situated about 25 yds from the E shore of the loch, to which it is connected by a causeway. 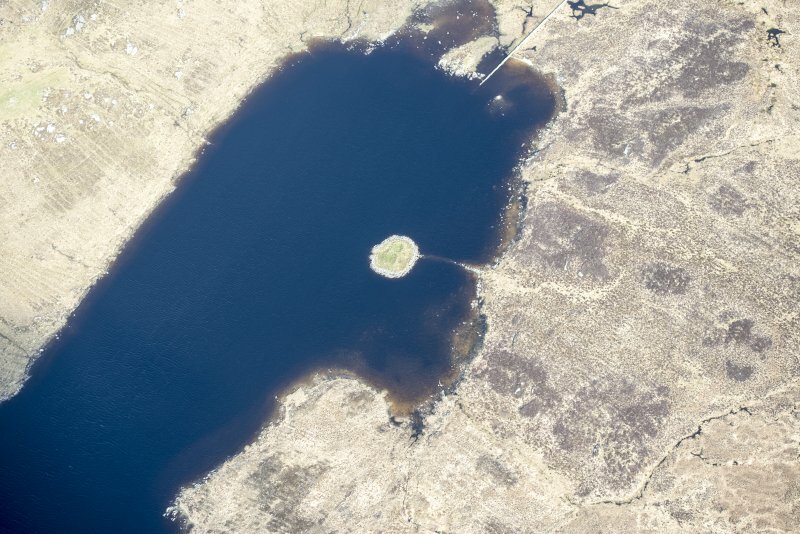 The island, surrounded by the remains of a dilapidated and pillaged wall, contains the ruins of several rectangular buildings which may or may not belong to the dun. 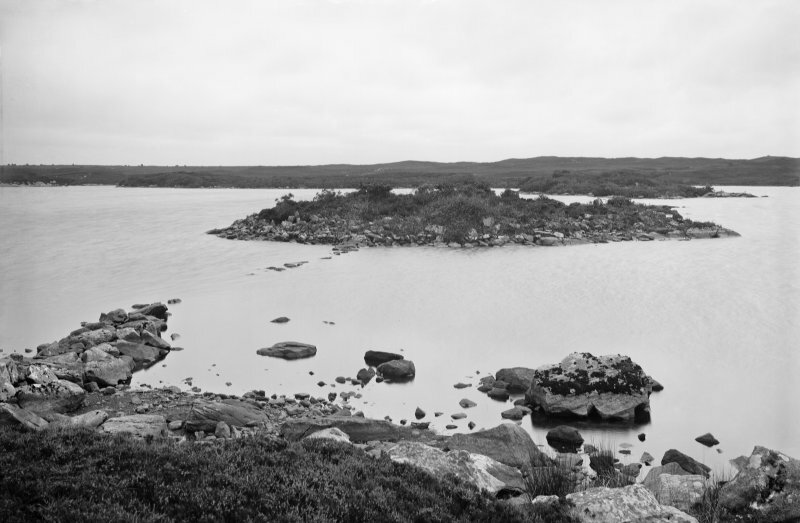 (R W Feachem 1963) Beveridge (E Beveridge 1903) states that this dun, occupying an artificial island, is known locally as Dun Anlaimh, the contradiction between this and NM15NE 11 being explained by the fact that loch nan Cinneachan and Loch Anlaimh were originally one. E Beveridge 1903; R W Feachem 1963. 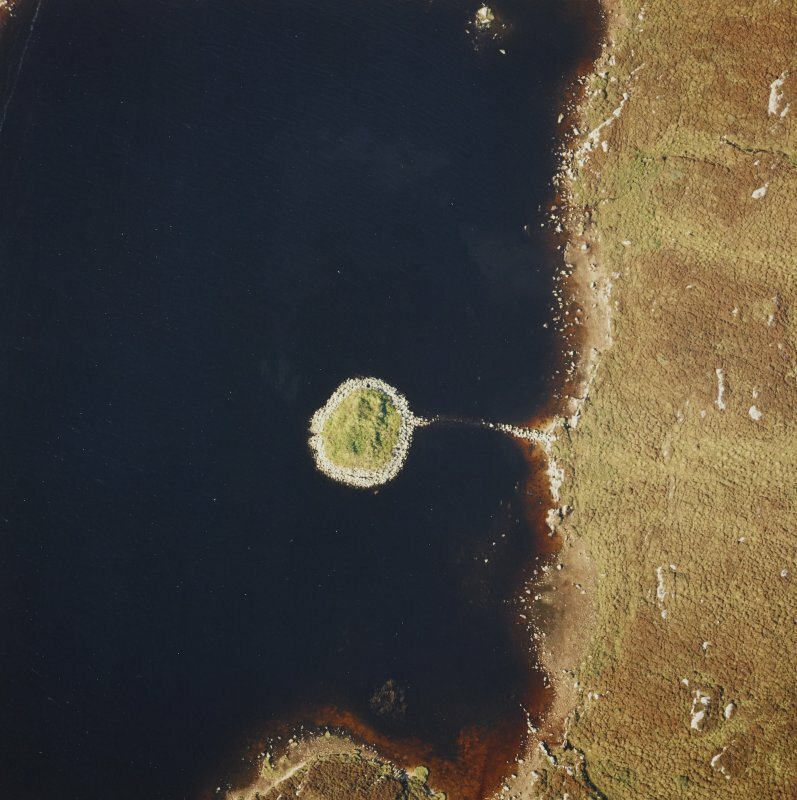 Dun Amhlaidh (H MacDougal and H Cameron 1937) an artificial island with traces of an oval roughly-built drystone wall around the perimeter. The base course of the outer face can be traced intermittently (particularly in the W) giving overall measurements of 23.0m N to S by 18.0m transversely. 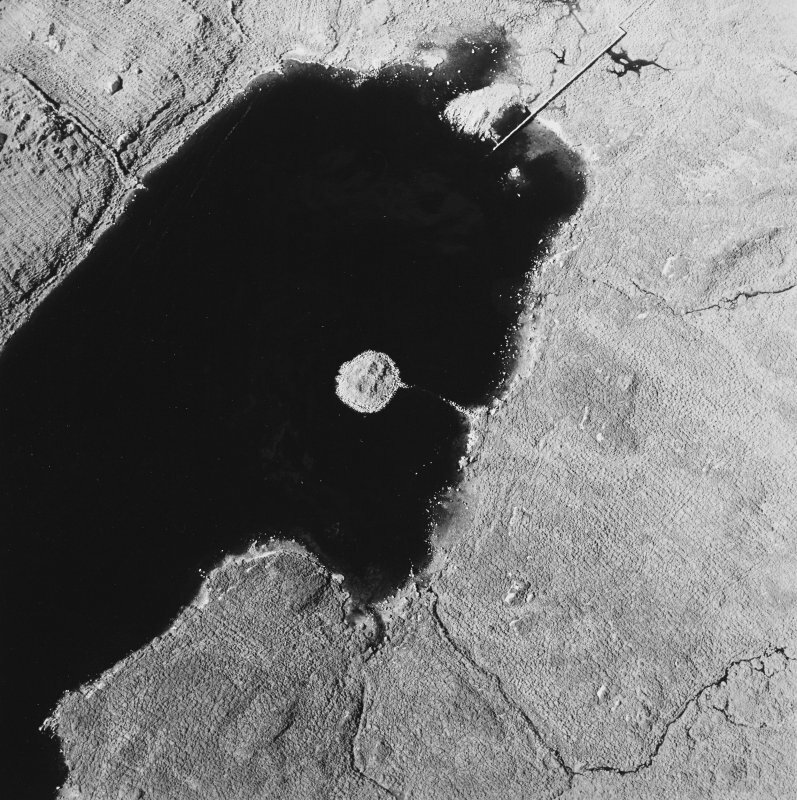 The remains, which are probably those of a crannog, are transversely approached along a curving causeway. Occupying the island are two, possibly contemporary, rectangular, dry-stone buildings, oriented N - S, placed end to end, and sharing a dividing wall which is 1.7m thick. The N building measures 5.7m by 3.3m internally. The entrance in the NW corner is 0.6m wide. The S building measures 7.0m by 4.0m internally. The entrance may have been mid-way along the W wall. The outer wall faces are not visible, but the walls of both buildings appear to vary between 1.0m and 1.3m in thickness and stand to a maximum height of 1.0m. Visited by OS (R L) 24 June 1972; H MacDougal and H Cameron 1937. (A and B) are grouped in an overall linear plan aligned N-S; they share a central end-wall and are based upon an E side-wall which appears to be continuous at its lower levels. The walls are of dry-stone construction, measuring approximately 1.3m in average thickness and standing to a maximum height of 1.5m. Internally, building A measures 7.1m in length by about 4.1m transversely, and a doorway about 1m in width is situated towards the N end of the W side-wall. Building B measures 5.6m in length by 3.4m in width internally, and an entrance with splayed ingoings is located in the rounded NW angle. A third and smaller building (C) abuts the W wall of the principal range and lies adjacent to the entrance-doorway of building A; it measures 3.2m in length from NE to SW by 2.1m transversely within walls 0.8m in average thickness. The entrance is placed in the SW end-wall. It is difficult to estimate the age of these remains, but they resemble certain fortified islands of later type identified in the Outer Hebrides and can probably be ascribed to the medieval period. The site has no recorded history, but local traditions tend to support the view that it was occupied in the later Middle Ages. NM 1884 5684 Oval stone-covered mound with three buildings and substantial causeway.